He caused a full blown emergency turn out of ambulance, fire and police crews that all attended the scene, Alan Tilbury reports. 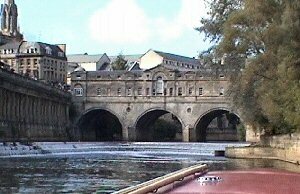 This occurred in the early hours of the 3rd February at 2.15am at Pulteney Bridge with the man taken to a mental health ward of the hospital. In addition to the full emergency teams, a boat rescue team was also involved in getting the man out of the water where he was treated by paramedics. The Avon has claimed the lives of 14 people, many students, since 2008.